There are two notable reasons why it is amazing to watch video on Android phones and tablets, like New HTC One M8, Galaxy S5/S4, Google new Nexus 7, Kindle Fire, Surface Pro 2, etc. First, most Android devices have removable battery, enabling users to play videos for a long time. Second, many Android phones and tablets have expandable storage with the support of SD card that lets you never run out of room for your videos and movies. These two killer features on Android enable people to save a good deal of videos to the device and play them anywhere at any time. However, you may notice that only videos in H.264, MP4, AVI are playable on Android device when transferring videos to Android phone or tablet for playback. Luckily, things will become simple with the best video converter for Android. Let the software do the video encoding and conversion, and you could play all videos on Android right away. MacX Video Converter Pro is the best-selling video transcoder helping Android users convert any high definition videos and SD videos to be supported by Android devices like a breeze. Only a few clicks are needed before you can convert video to Android and watch video on Android mobile devices immediately. Built in over 420 video and audio codecs, this is the best video converter for Android that fully supports converting HD MKV, M2TS, AVCHD, MPEG, MOV and other imaginable video formats. Another strong point lies in the Android profiles preset in this best tool, which are exceedingly useful for non-tech savvy users to convert the video directly to any kind of Android tablets and phones on market. In addition, this best-ever Android video encoder delivers an optimized speed and first class video quality. How to Convert Video to Android Device with this Best Video Converter? Run MacX and import source video by clicking "Add File" button. You can also add more than one video files and convert them at one time, because this Android video converter supports batch conversion. Click the file in the preview window and select a specific output video format. You may see all the profiles are preset, so you only need to select the Android phone or tablet from the device list, like Samsung Galaxy S5/S6/S7, HTC One M8/M10, Galaxy Note 3/4/5, etc. Click the "Browse" button to choose the path where you want to save the output video in. So later you could locate it from there, transfer it to your device and watch the video on Android phone or tablet as you wish. With the above steps done, please click the "RUN" button to begin video to Android conversion, you could view the conversion progress. It is worth mentioning that MacX Video Converter Pro is far more than merely the best video processing program for Android users. It is also a flexible Mac video converter to convert videos in a wide range formats to iMovie, iTunes, Apple iOS and Windows devices etc. For those who want to convert video to iPad Air 2, or download YouTube video to Mac free for personal use, this is an ideal program to get things done quickly with no hassle. This guide shows you how to use the best yet free video to Android phone converter to convert and put video to Android phone to enjoy video freely. What's the video formats that can be played on Android (Samsung, HTC, etc)? Here you will learn the supported video format for Android and Mac DVD ripper & video converter to transfer DVD movies and videos to Android playable video format on Mac OS. Are you still seeking for an easy solution to convert video to iPhone 5? 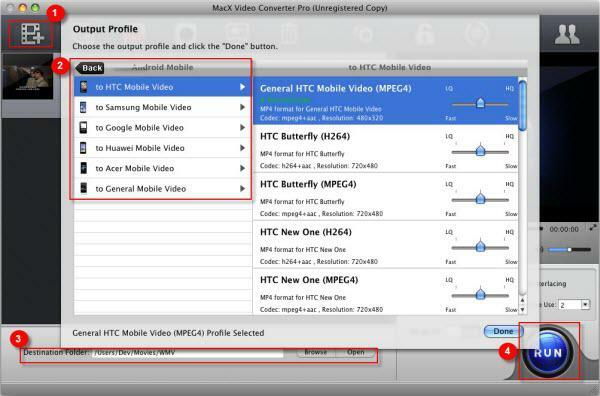 This tutorial will do you a favor with a professional iPhone 5 video converter. Just a couple clicks, you can therefore enjoy any videos on iPhone 5 on the go.